RUSH: Oh, by the way, folks, the Rush Limbaugh app is kicking rear end. It’s in the top five in the App Store on iOS. I don’t know where it is on Google Play. We have a lot of Android users. We know these things because we know the devices our customers, our members, are using. And it’s taking off again every time I mention it. I just mentioned it one time yesterday and it’s already in the top five. And we’ve upgraded the app. The app was upgraded. We unveiled the new version yesterday with a new podcast tab. You can listen to podcasts, you can download podcasts very easily right within the app for offline listening. You can now subscribe if you’re not a subscriber. You don’t need be a subscriber. This is something I need to emphasize. This app, the Rush Limbaugh app or website has an encyclopedia worth of information. There is that much information and data that you can access, archives of radio programs, transcripts and so forth, video highlights of some TV appearances, some of the old parody songs and bits that we’ve done. A lot of that is on the free side. You don’t have to spend a dime to be able to access the app. But if you get the app and someday you can subscribe, you can do it right within the app, subscribing at 24/7 through your iTunes or Google Play account. We have added access to days and days of additional transcripts. You can just keep endlessly scrolling back through content now. We made massive improvements to the audio and video player so you can more easily skip from episode to episode. We put a Famous Quotes tab, home tab section. Yesterday I made mention of the fact that one of the most fun things you can do is look back on election night coverage on any network, starting at 7 o’clock. Koko and the gang have put together an edited video that you can find at RushLimbaugh.com and on the app. You don’t have to go YouTube now and hunt. We’ve done it for you. And you don’t have to watch two hours of this stuff. We have edited it so that you can get the effect. We had, shall we say, a preemie version of this, and then we finalized it overnight to get to the final cut, the final edited version of this. 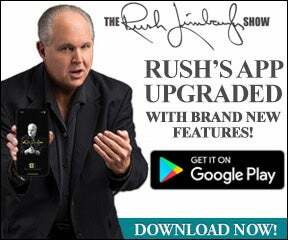 So I just wanted to remind you again, version 4.0, Rush Limbaugh app on the Google Play and iOS App Store. It looks great, and it makes accessing everything on this program and our website as easy as possible now, including the podcasts. And literally the amount of information on my website accessible via the app is now encyclopedic, and you have the ability to share any of these transcripts from programs that you find. For example, you’re listening one day and you hear something you really agree with. “Man, that’s good.” And you try to remember it. You want to tell your friends about it. You don’t have to anymore. Just go to app, find that transcript, and share the whole thing via the “share” button — email, message, however you communicate with people. The “share” button. And more and more transcripts now are accessible via the new upgrade. And if you search for it, just search “Rush Limbaugh.” It’s up and running.